A man has been jailed for life after he admitted the religiously-motivated murder of a Glasgow shopkeeper who he claimed had "disrespected" Islam. Sunni Muslim Tanveer Ahmed, 32, from Bradford in Yorkshire, stabbed 40-year-old Asad Shah outside his store in Shawlands on 24 March. Ahmed had said he killed the shopkeeper because he had posted videos online in which he claimed to be a prophet. Mr Shah was an Ahmadi, a minority sect not recognised by all Muslims. Why was Asad Shah murdered? Last month, Ahmed had pleaded guilty to the religiously-motivated murder at a hearing at the High Court in Glasgow. Jailing him for life at the same court, judge Lady Rae told Ahmed: "This was a barbaric, premeditated and wholly unjustified killing of a much loved man who was a pillar of the local community. "He was described as a peaceful and peace-loving man and family man who went out of his way to show respect for those of any faith." The judge branded the attack as "an appalling display of merciless violence". 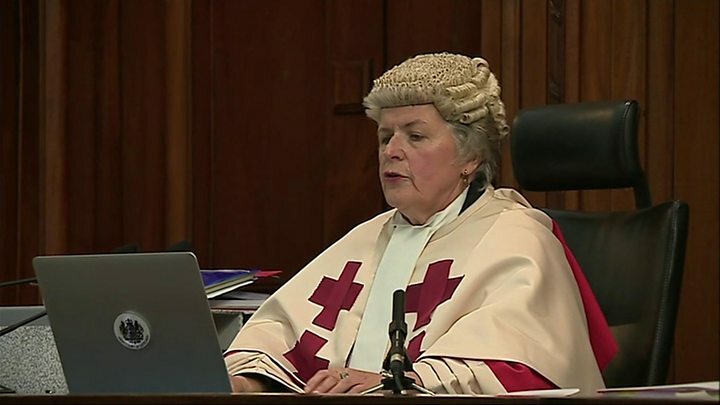 Lady Rae added: "No-one in any civilised country including Scotland has the right to take the life of another whatever offence that individual perceives that he or she has suffered. "It is vitally important in modern society that respect and tolerance for others of any race, creed, colour, ethnic origin or religious belief is maintained and protected by the law of the land. "I note with considerable concern that you have expressed no remorse whatsoever for this appalling crime." As Ahmed was being led to the cells to begin his sentence, he shouted to his family and friends in the public gallery in what is believed to be Arabic and they chanted back at him. The court previously heard that Mr Shah was an Ahmadi who differ from the majority of Muslims, including Sunni Muslims, in that they believe the Prophet Muhammad was not the final Prophet. The majority of Muslims believe Muhammad was the final Prophet and say any other view is inconsistent with Islamic belief. Ahmed, a Sunni, claimed that he had killed Mr Shah because he had posted videos online in which the shopkeeper had "disrespected" Islam by claiming to be a prophet. Ahmed watched a clip featuring Mr Shah on his mobile phone as he travelled to Glasgow on the day of the murder and was heard in a phone message to say "listen to this guy, something needs to be done, it needs nipped in the bud". When he arrived at the shop, Ahmed said he warned Mr Shah that he was there to kill him and asked him to stop claiming to be a prophet. 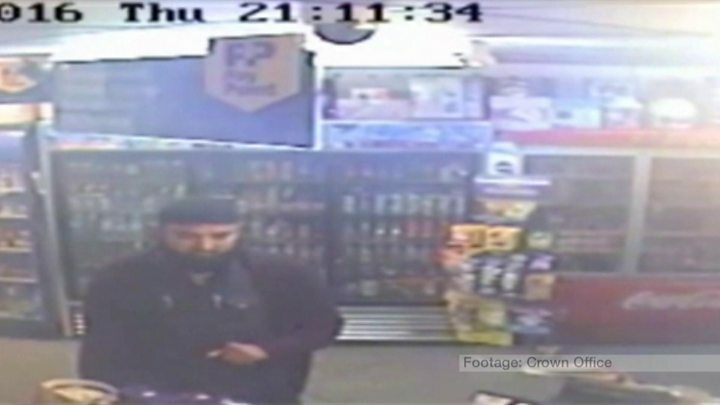 CCTV footage of the attack showed Ahmed pulling a knife out and moving behind the counter and stabbing Mr Shah repeatedly. The shopkeeper managed to get outside, but was stabbed again and then stamped on and kicked in a frenzied attack as he lay dying in the street. Mr Shah's brother Athar Shah tried to intervene, but was unable to fend off Ahmed. As Mr Shah lay dying on the ground, Ahmed walked calmly to a bus shelter where police found him a short time later. After being arrested, Ahmed released a statement through his lawyer saying he had killed Mr Shah as he had falsely claimed to be a prophet. After Ahmed was jailed, Ch Supt Brian McInulty, of Police Scotland, said: "I hope that the sentencing today will reassure the immediate community in Glasgow's south-side as well as communities all across Scotland that acts of violence such as this are utterly unacceptable and cannot be justified. "Glasgow is a strong, united, multi-faith community that has immense pride in its diversity. "Religious intolerance in any form is simply not tolerated in our society and Police Scotland will work in partnership with our communities to eradicate such behaviour." The Shah family moved to Scotland from Pakistan in the 1990s to escape persecution over their beliefs. No members of Mr Shah's family were in court to hear the sentence imposed, but friends were in the public gallery. A victim impact statement written by Mr Shah's sister Attia on behalf of Mr Shah's family said: "Our pain goes beyond our vocabulary. We have tried, in an inevitably inadequate way to capture the feelings and emotions that no person should ever have to do. "One of the most tangible and far-reaching consequences of this tragedy is that, as a family, whilst our bond will last forever, we have fragmented and many of us have or are in the process of leaving Scotland, in search of a new life, away from the memories we used to cherish but are now the source of immense pain and suffering." The statement said Mr Shah's widow has been "brutally deprived of a life and companionship with her soul-mate and kindred spirit, the love of her life".